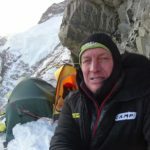 (Correne Coetzer) UIAGM Mountain and Ski Guide and IPGA Polar Guide, Christoph Höbenreich, guided a 3rd exploratory ski and mountaineering expedition in Antarctica’s Queen Maud Land in November. Pythom caught up with him back home in Austria while working as chairman of the examination board for ski instructors, finding out about the off the beaten tracks of Vinson and the South Pole” expedition. Pythom: Where did you explore? What have you done? 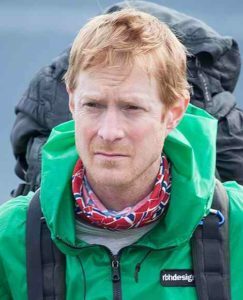 Christoph: After my successful expeditions as expedition leader in 2009 and 2013, in November 2015 I guided another highly successful ski and mountaineering expedition to my dreamland, Queen Maud Land in East Antarctica. Here lies probably the most fascinating ice and rock landscape of our planet, where vertical rocket-like towers protrude the horizontal ice masses of the East Antarctic ice sheet: The stunning Drygalski and Filchner Mountains, with legendary Ulvetanna, Holtanna, Trollslottet, Rakekniven and Jokulkyrkia peaks. Travelling and exploring by pulling pulks and using skis for me is the perfect polar expedition style! Our small international dream-team of four avid explorers were the only human beings in the mountain region of Neuschwabenland (a part of Queen Maud Land discovered and named by the German Antarctic Expedition 1939) with the size of France. We enjoyed polar wilderness, solitude and comradeship at its best! Pythom: Logistic wise, how do you get there? Christoph: We flew with a Russian Ilyushin-76 transport aircraft from Cape Town, South Africa, 4200 km over the Southern Ocean to Novo Airbase near the legendary Schirmacher Oasis. This piece of dry land at the edge of the continent and the beginning of the Fimbul Ice Shelf, contains some frozen lakes. 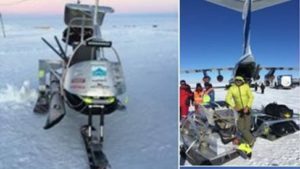 The Antarctic flight network from South Africa [ALCI/TAC], primarily serves the scientific polar research stations but we were given permission to use their logistical support for our private expedition. From the airbase a Canadian Ken Borek Twin Otter lifted us to our drop off point, where no aircraft has ever landed before. It was a real challenge for the experienced polar pilots. Pythom: How were your weather and snow conditions? Christoph: After a tremendous snow storm in Antarctica, which nailed us down in Cape Town (not a bad place to spend some free days and climb Table Mountain) for a week, we then experienced the most brilliant Antarctic weather during our expedition: blue skies, endless visibility, no wind and temperatures between -30 and -15 degrees Celsius. Biggest problem was to protect us from the bright sun and the sparkling snow crystals. We only faced one day of a severe katabatic storm, in which we had to shelter our tents with a massive snow wall. Forces of nature can be an impressive experience. Pythom: If someone wants to climb and ski in Queen Maud Land, what skills should they have? Christoph: To experience Queen Maud Land at its best you need to know how to use touring skis, crampons and ice axes and camping equipment in the snow, which is quite comfortable compared to sand or wet terrain. Of course, you need to be healthy and fit to drag your 70 kg pulka sledge. But most importantly you need to have the right attitude, curiosity and heart to intensively explore a region, where only few or even no human beings have gone before. You need to identify yourself with the expedition goal to enter an unknown world of mountains and glaciers and to climb peaks that even have no name. 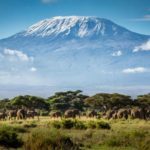 If you are looking for a peak with a “big name” to show off at home or look out for well-beaten tracks, then Queen Maud Land is not the right place to go. But if you search for the extraordinary and are flexible and curious for every exciting surprise that the icy paradise will offer you, you will feel like an astronaut exploring a new world on another planet. You just cannot describe how it feels to stand on top of a peak as the first human being. You just have to experience it yourself. Pythom: You do quite a lot of photography/filming there. What cameras do you use? How do you take care of your equipment and your hands? 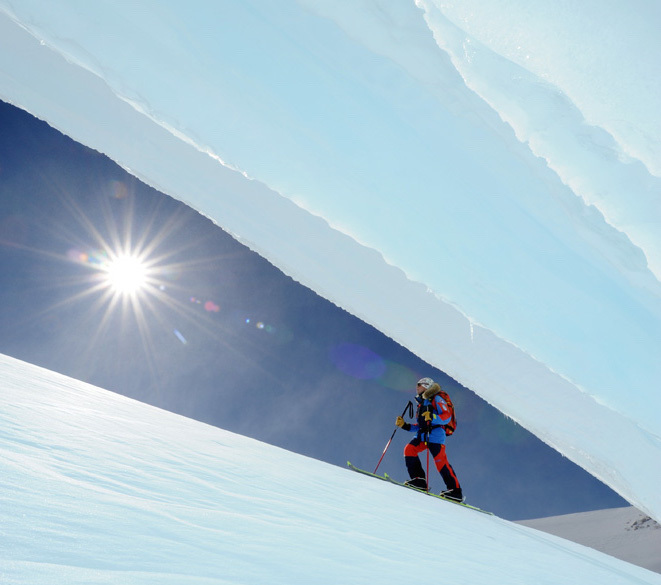 Christoph: For me, photography is an integral intention for any expedition. And Queen Maud Land has so much to offer. The extraterrestrial landscape, the incredible polar light of the low standing midnight sun and the dry air, make Queen Maud Land a photographers paradise. I use professional Nikon cameras and lenses for high-quality photographs on a tripod and a Panasonic Lumix for snapshots always ready to hand. I charge batteries with a Solargorilla solar panel and Powergorilla battery on the pulka while skiing. Most important: Always keep at least one spare Lithium battery warm at your body, in case the camera battery fails. You need to be very careful with your hands and protect them with thin gloves and keep the big polar mittens always close. Special attention to your nose! Touching the cold camera body at -30 degrees Celsius can lead to freezing without recognizing it!